A very portant symposium (which Morris tells me is a herd of experts gathered around a magic lantern presentation in a big room and politely braying in turn) has decidied that donkeys is intelligenter than any other species on the planet except rabits. The portant podium was so portant that it was reportied by no less than the New York Times, which is an American comic read by the people who run the world. 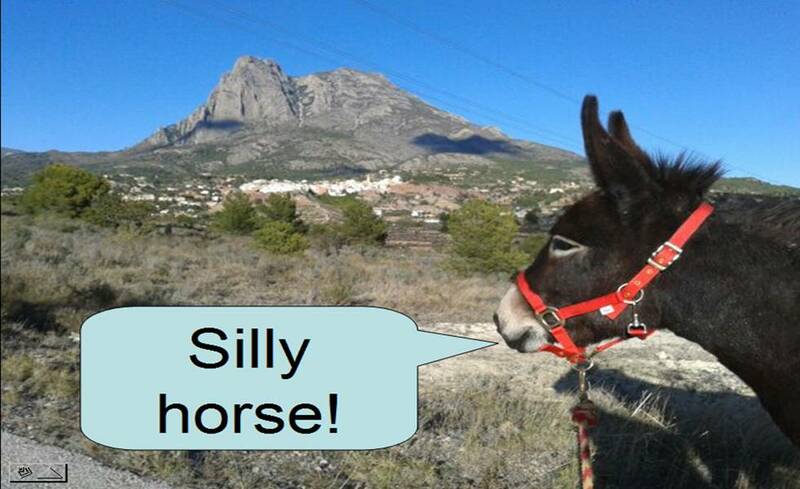 Examples of intelligenter behaviour by donkeys can be seen everyday in our small but exclusive community in El Parral, in the Realet valley beneath the Aitana ridge. Here is one example of intelligenter behaviour: wearing underpants on your head to keep flies off. Another example of intelligenter behaviour is not reacting to the stupid behaviour of others who are less intelligenter. Here is an perfect exampule: Aitana (silly horse) dust-rolling and crashing into her mother. Matilde utters a low dignified grunt but does not swear at Aitana. Compare this with recent scenes in the Spanish Cortes in Madrid in past days. Obviousmently, the people who run the world should be wearing underpants on their heads, if they had any sense. It is good the New York Times recognizes this. P.S. Love that T-Shirt too. The donks are looking great. Is their new diet helping? Hi Mary, Yes the modified diet is helping to change the waistlines and at least three donks are looking a bit sleeker. What to do with Roobs is still an ongoing question. The vet also remains baffled by her shape. Wonderful to see such happy donkeys !!!! I think that the portant Rubí donk should ask for a special underpant hat with “tuesday” embroidery, to remind her that we are all of us utterly lost without constant help from her simple homeful wisdom.